With all previous chapters in mind, we have designed HDfury. 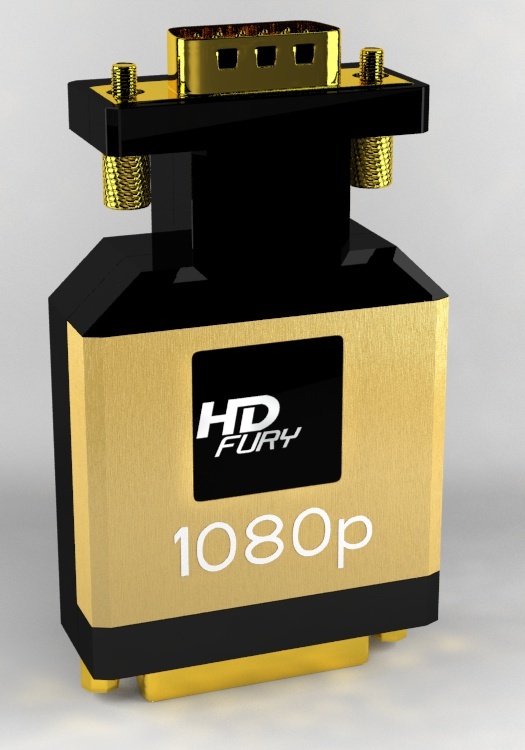 HDfury module will transform any “technically able” ANALOG display into a DIGITAL display performing a perfect visual HD&Full HD fury @ 720p/1080p from any HDMI/HDCP sources such as PS3, X360 Elite, HD-DVD&Blu-Ray player, SAT&Cable HDTV setbox, HDMI graphic card, and more. 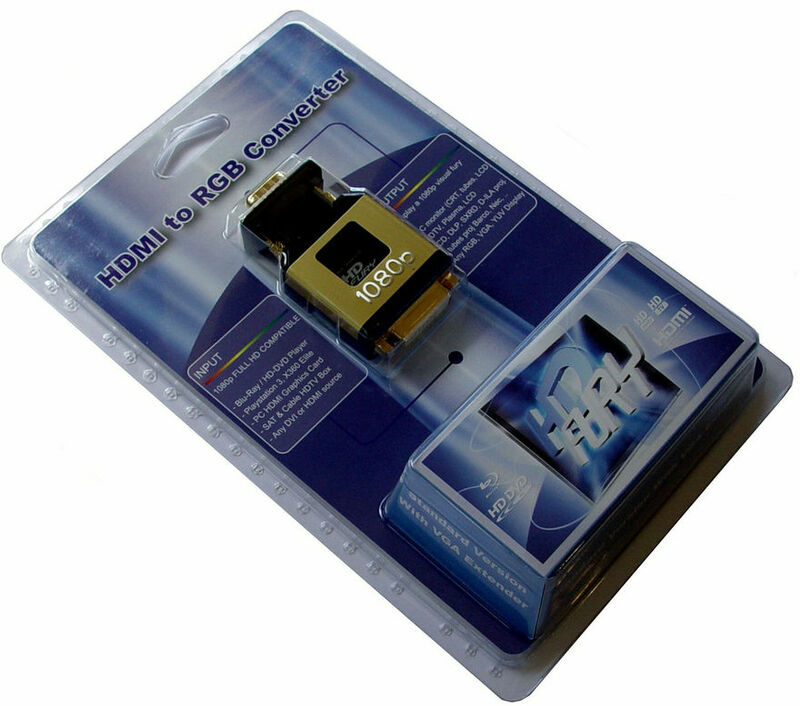 DVI/HDMI(HDCP) input/convertor module for RGB display (so-called “HDfury 1080prgb”). HDCP rules compliant: no end-user access to decrypted analog video. Once screwed, this module becomes “a part of the display itself”. - HDfury is also compatible with the 3 Tubes projectors from Barco such as BD701, BG701, Ciné 7, BG800(s), BG801, BD808(s), BG808(s), BG1208(s)(/2), BG1209(s)(/2), Cine 8 (Onyx), Zenith Pro 1200, Cine 9, Cinemax. HDfury Module is the same in any editions only the supplied cable is different, therefor anyone who need the module only can get his hands on any editions. Cable is ALWAYS optionnal, for example VGA Xtender is supplied in case your display have tiny space and a backpanel, you may need to use the VGA xtender so your back panel can fit back correctly. As many Barco owners already have a source connected to their 5x BNC input, we made a special BARCO edition (RED) with a DB9p cable that you can hook up on Port3 of your Barco proj. The Blue Edition is the most common and standard for HDTV, LCD, CRT, PC screen, any display with a SUB-D HD15 FEMALE input. The backside of the packaging (see HDfury pictures & packaging section) will represent the different “hooking” way and will be printed accordingly to their color code : RED for Barco, GREEN for Marquee/NEC and BLUE for the standard edition. In the earlier implementation of HDMI/HDCP when the specs was not yet finalized, some manufacturers had estimated that supporting DVI(HDCP) displays was not a priority since there were only a few DVI(HDCP) displays available at the time. Today all HDMI sources support all DVI(HDCP) displays. If you own one of those olders sources and if you are unsure whether or not that it will support the HDfury, the only test possible is to try hooking up your source device to a DVI(HDCP) display ! A manufacturer firmware upgrade may be needed to fix this issue on your source device in some cases. We recommend using a HDMI > DVI-D cable of great quality without any HDMI to DVI adapters. 4) My display technically supports 1280×720 (and/or 1920×1080) through its VGA input (RGBHW either 5xBNC/Sub-D HD15/DB9) and I’m using a recent HDMI source. Unfortunately I have no picture on the screen. - The DVI or HDMI source is unable to deliver the 0.5A maximum current over its HDMI or DVI pin #14. We recommend that a power supply be used for all sources other than the PS3 and Xbox360. - Provides the correct polarity with ‘plus’ on the OUTER part of the plug and ‘minus’ (ground) on the small center pin of the DC jack. 5) Some notes on when you first connect the HDfury ! 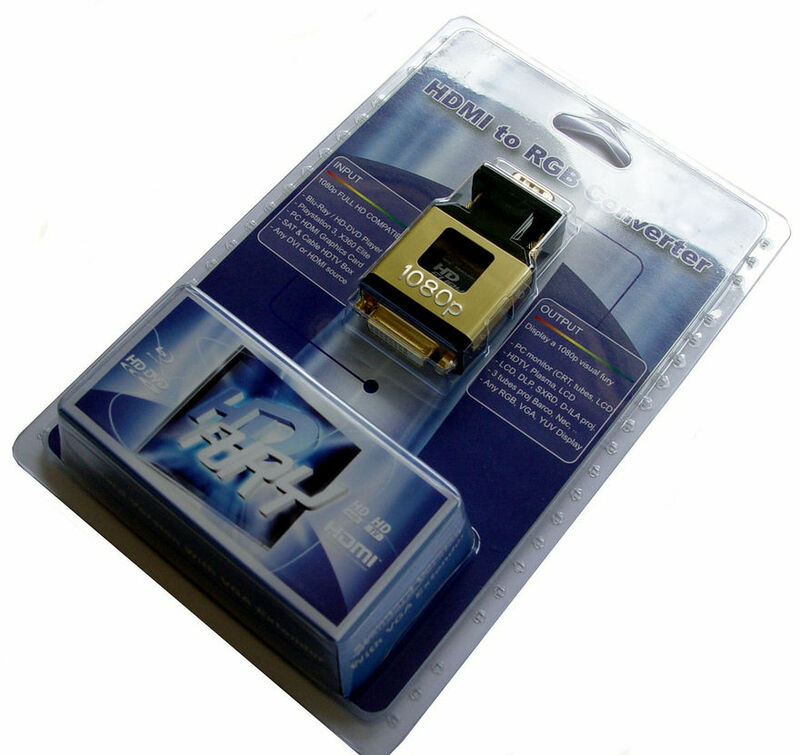 The HDfury is a tiny external add-on adapter that is used to add a digital DVI/HDMI input to older display devices without digital inputs so that the newest sources such as HD-DVD/Blu-ray players can used.It is connected to any RGB display through the SUB-D HD15 (VGA) Female Input or RGBHV BNC inputs using an optional extender cable. Once in place the HDfury performs HDCP decryption and HDMI to RGB conversion. You can then connect any HDMI source in full HD 1080p directly to your now “enhanced” display! HD-DVD players, Blu-Ray players, HDMI graphic cards, PS3, Xbox 360 Elite are all able to unleash their true potential (720p/1080p mode) only through the HDMI output. If you want a valid ticket to the Full HD world you either need a compatible display (with HDMI input) or a solution for your existing display. 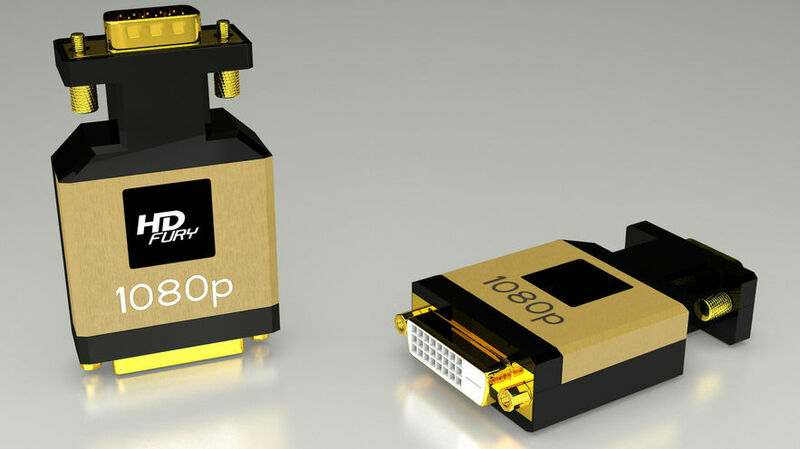 HDMI is a new standard that comes with a form of hardware protection called HDCP. If your display doesn’t have a HDMI input you won’t be able to display 720p/1080p signal on it (from HDMI sources). Prior to exchanging Video data, the HDMI source exchanges HDCP keys with HDMI display. Both devices have a special HDCP chip embedded. If your display doesn’t include an HDCP chip, even if it’s technically able to display 720p or 1080p signal, it will display a BLACK SCREEN. On some devices (ex: Playstation3, Xbox360) 1080p mode is only available through the HDMI output! Prior the HDfury, what could I do if my display was not HDCP compliant? - They need extra wires for the power supply and analog cables. - Often switches or settings need to be tweaked. - Quality is limited and restricted because of the longer analog link. - They are not compliant to HDCP rules as they allow easy access to the decrypted analog video. What are the advantages of using HDfury? - HDfury can screw directly to your display therefore (unlike the stripper/converter boxes) it remains compliant to the HDCP rules as it does not allow and end-user easy access to the analog decrypted signal. - It can therefore be used and sold legally to transform any RGB display into a HDCP compliant display. - Shortest analog link possible ensures the highest video quality possible! - Aluminum and gold plated materials. - It does not require external power supply to operate. Does the HDfury change the resolution? Upconvert or downcovert? The HDfury does not change the resolution or refresh rate in any way. It simply converts the digital input signal to an analog RGBHV (VGA) signal. It also provides HDCP decryption if needed. The HDfury outputs whatever resolution you feed it. Absolutely nothing is changed. In other words, if you feed the HDFury a 720p/60Hz digital signal the only thing it will output is a 720p/60Hz analog signal. Feed the HDfury a 1080p/60Hz signal and it’ll output a 1080p/60Hz signal… and so on. I use component cables to connect my HD-DVD/Blu-Ray player to my display device and it works just fine! Why do I need HDfury? HD-DVD and Blu-Ray players can also upconvert standard definition DVDs to higher resolutions (720p, 1080i, 1080p), but they only do this via the HDMI outputs (not component). So if you want to get the higher resolution benefits of your player’s upconversion circuitry, you’re forced to use HDMI. As well, in the future it may not be possible to pass certain high definition content over component video cables. A content flag called the ICT (Image Constraint Token) allows broadcasters and movie studios to limit or “down-res” the HD video signal to standard definition 480P resolution over component video cables. This is not something that has been activated yet, but it could be used at some point in the future. And the most important reason to use HDfury: The picture quality is substantially better! (Sharper/cleaner/less noise/less ringing/etc). Read the reviews above for some examples! My display has composite (ie: combined) sync with only 4 BNC inputs not 5. (Examples: Barco 7xx/Cine7 or Ampro). What cable do I order? How do I hook it up? Order the GREEN (5-BNC breakout cable) and combine the H/V sync lines using a $2 BNC T-connector like this. You could also use an Extron 109 or 202 box as well to combine the two sync lines. My Barco requires negative sync to work. Does the HDfury output negative sync? The HDfury does not alter the signal that it is fed in any way. If it is fed a negative sync signal, it will output a negative sync signal. If it is fed a positive sync signal, it will output a positive sync signal. You can use boxes from Extron or Altinex to invert the sync if required. To alter the sync to make it work with your projector, add an RTC2200 box to your HDfury setup. It adds others benefits (Center Picture and Gamma Adjustement) to the HDfury in addition to providing adjustable sync. I have a scaler or doubler (ex: Lumagen) with DVI inputs and an RGBHV output connected to my display device. I don’t need an HDfury right? Incorrect. You still need the HDfury if you want to use HDMI sources such as HD-DVD and Blu-Ray players that may have HDCP-protected content. The scaler, by law, is not allowed to output content via RGB if the source content is HDCP protected. The scaler will simply TURN OFF its analog RGB output. Only the digital DVI/HDMI outputs will remain on. To solve this, connect the HDfury to the DVI output of your scaler, and then connect the HDfury to your display device. Simple! I have a scaler or doubler (ex: Lumagen) with DVI inputs and a DVI/HDMI output connected to my display device’s DVI input. I don’t need an HDfury right? Maybe. You still need the HDfury if you want to use HDMI sources such as HD-DVD and Blu-Ray players that may have HDCP-protected content *and* your display device does not have an HDMI input. The scaler, by law, must pass the HDCP-protected content all the way to your display device. The display device must decrypt the content. If your display device only has a DVI input, it will not decode HDCP. To solve this, connect the HDfury to the DVI output of your scaler, and then connect the HDfury to your display device. Simple! I want to connect a longer cable to the output of the HDfury. Can I do that? No. Keep the analog cable between the HDfury’s output and the device it is connected to as SHORT as possible. Only use the HDfury plugged directly into a display device, or use one of the 3 very short (4-6″) RED/GREEN/BLUE high quality extender cables that comes with the HDfury. Failing to do so will result in a lesser than optimal image quality. Reason: The HDfury was not built to drive cables as it does not have an output stage. If you can’t keep the HDfury close to the display device, no problem! Keep the cable short by plugging it into your scaler passthrough, transcoder with passthrough, your switcher, Extron booster, or any other device with an output stage meant to drive longer cables. If you really want to use a longer output cable to your HDfury, add an RTC2200 box to your HDfury setup. It also adds others benefits (Gamma Adjustement, Center Screen) to the HDfury in addition to providing the ability to drive longer cables. The specs say that the HDfury draws it’s power directly from the DVI/HDMI line but that an optional +5VDC input is provided for HDMI cables that are over 5 meters (16 feet) or if the source device is unable to supply adequate power. What sort of power supply do I need for this? When do I need to use an external power supply? - The DVI or HDMI source is unable to deliver the 0.5A maximum current over its HDMI or DVI pin #14. This situation often occurs when HDFury is used with cheap DVD/HD players at 1080p60 mode. Update: The picture quality is often also improved by using an external power supply. Users are reporting that using an external power supply results is a punchier image. For this reason we are highly suggesting that everyone looking for the best image quality possible always order the HDFury Advanced package as it ships with a power supply and some other extras. Does the HDfury support 1080p/24fps found in next generation HD-DVD and Blu-Ray players? Yes! The HDfury simply converts the input signal from DVI-D digital to RGBHV analog (and applies HDCP decryption if required). It doesn’t change the the resolution or refresh rate – it simply passes it through. As long as you stay under the 1080p/60 bandwidth requirement (ie: the 165Mhz pixel clock rate), it doesn’t care what the resolution or refresh rate is. I connected my HDfury but the image is shifted to the left. How do I fix it? The picture is shifted to the left is normal when you connect HDfury for the first time. Simply adjust your display’s settings to shift the image back. This needs to only be done once. On some European CRT displays you will not be able to shift back far enough because of the US/Euro HD ‘porch’ differences. If this affects you, switch your source to 60Hz to solve the problem. You can setup a new memory and it won’t disturb any of your original settings. As the HDfury comes with his own EDID, you will always have the H position to adjust. For example, you can connect HDfury to your PC VGA screen, and you will see that the first time the picture is shifted to the left. You can then adjust this setting on your PC display, and it will be perfect. If you connect your computer back to the PC VGA screen, the image will centered as before! Your screen / display has memory functions to store your settings depending on the source. There is no other settings to adjust. If you need to shift the image back and cannot do so with your projector, add an RTC2200 box to your HDfury setup. 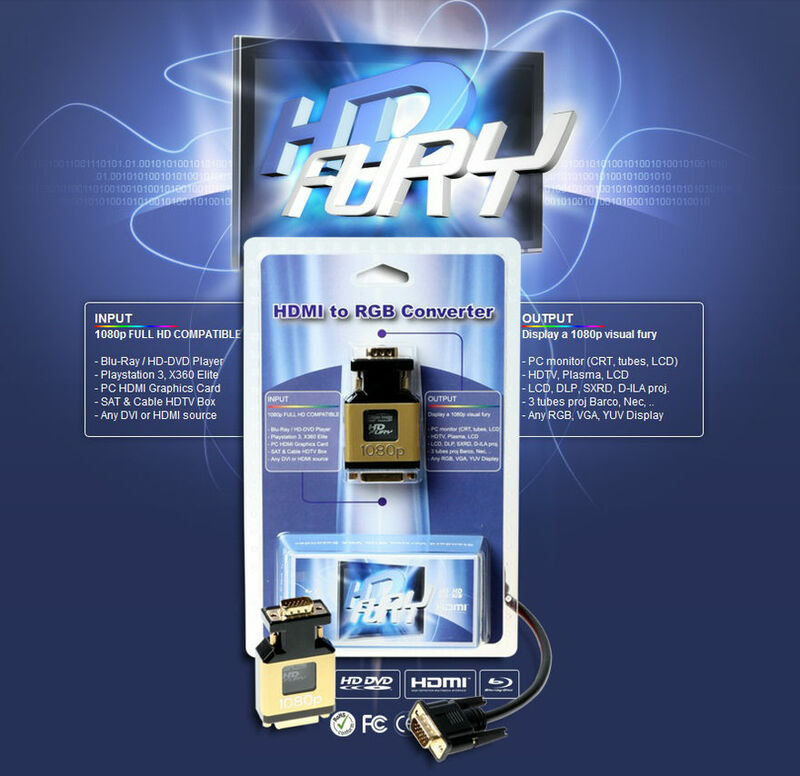 It adds many benefits to the HDfury in addition to providing image shifting capabilities. My picture is cropped (cut off). How do I fix it? See the last question. The image is likely only shifted slightly. The HDFury doesn’t process the incoming digital video stream to ‘cut’ the image. The HDfury remains synchronous the the pixelclock of the digital video inputed (no process, no frame buffer, ….). It just converts the digital pixel data to analog, nothing else. If the picture is truly cropped, then, this is due to the source device. If you need to shift the image back and cannot do so with your projector, add an RTC2200 box to your HDfury setup. It adds many benefits to the HDfury in addition to providing image shifting capabilities. The black level (brightness) on my display device is constantly changing causing dark and light scenes to change in black level. How do I fix it? Your display device may have poor black level clamping and you will therefore see this problem with any source device with or without the HDfury. If you have a way of adjusting it, try to adjust the ‘Clamp’ setting of your display to ‘H/C’ (horizontal/composite sync) mode rather than ‘Auto’. Not all displays will have this setting. Many consumer displays will have this hidden in a service menu. My projector or display device has a 3-prong power cable with a ground pin. I’ve bypassed the the ground pin. Is this a problem? YES! Not only is this very dangerous to you (the homeowner) you may damage your HDfury and/or your display. Your HDfury warranty is null and void if you bypass the grounding of your display device. Please do not do this! Bypassing ground pins because of ground loop problems, hum problems, or other reasons is very dangerous and only masks the problem. You need to fix the source of the problem. The ground pin is there for your safety and for the safety of your equipment. I’m still getting a black screen from my PS3 when using the HDfury. How can I fix this? The problem is that you likely connected the HDfury to the HDMI port while the PS3 was still setup to output by another port (component or composite). The result is no picture over HDMI. The PS3 will output low resolution on every output when you reset the display settings this way: PS3 in stand by mode, hold on power for 5 sec until you heard 3 beeps. I need a different extender cable or want to buy some extra cables or power supply. Can I do this? Yes! Anyone may order BLUE/GREEN/RED extender cables, power supplies, or HDMI-to-DVI cables separately on the HDfury order page. In fact, many people order the VGA to BNC breakout (GREEN) cable to use in other applications as it’s a very good quality short cable. is All orders include at least one free 6′ USB 5V cable for powering the HDfury from any USB port. Is the actual HDfury device used in the various packages the same or are there difference types of HDfury devices available? There is only one type of HDfury converter available. The same one is used in every package. The various packages only differ in the types of extender cables and accessories offered. If your setup changes and you need a different extender cable or accessory, you may order them separately on the HDfury order page. “I am so glad I did my homework and found this device through Curt Palme’s site. This saved me from upgrading to a HDMI projector. I can now take full advantage of the 1080P upscaling for standard DVD on my Samsung Bluray player and my HD movies look absolutely amazing. This is a must have option. I cannot believe how quickly it arrived from Taiwan to Courtice Ontario Canada . 4 Business days! It is simple to setup and works as advertised. I will have to tell everyone about this mini wonder of technology!” – Alan B. “Got my ‘Green Edition’ yesterday afternoon (Jul 13, 2007), direct-shipping from Taiwan. Curious as I am I had to try out how it’s working. And what can I say, that’s what I really call plug and play. Linked the thing with the 5-BNC-input of my DLP-projector, connected it with a HDMI-to-DVI-cable (5m long) to my upscaling DVD-Recorder and, voila, it worked great! “Well I ordered and received my HDfury Gamer Edition about 2 weeks ago. i ordered it late Wednesday night and it arrived on Monday, not bad at all. I hooked it up to my Viewsonic A90 CRT monitor and my PS3 and it worked right off the bat, running at 480p default. I then went into my PS3 options and changed the resolution: I can now run at 1080i! before the HDfury, i was using the composite video cable connected to a tv… looked like garbage. But now, it looks AMAZING. I finally feel like i got my money’s worth for my PS3, thanks to the HDfury making it look like its supposed to. With such quick shipping, affordable price, and phenomenal picture, I will be recommending the HDfury to everyone i know who is looking for high definition picture without the massive price tag of a new TV. EXCELLENT product!” – S.B.